Car additives to end many wear, performance problems. Buy online. 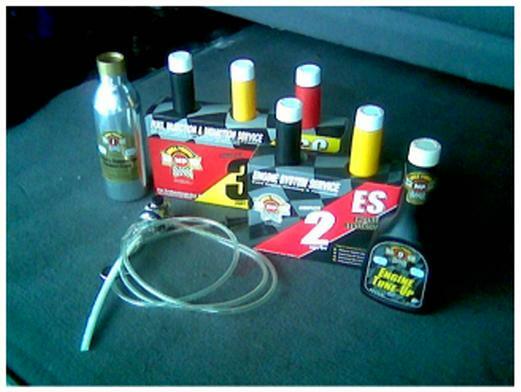 Some "car helping products" are cleaners containing solvents. Solvents are good for wherever air, fuel, combustion and exhaust go. They are mostly sold to add to the oil. Other additives are called called "oil treatments." Oil treatments thicken the oil. Other car additives combine those two and add others ingredients to solve problems solvents and oil treatments cannot. How good is it? Read Doug's car additive experience. These car additives give a tune up like power using conditioners and friction modifiers that really protect that part store additives do not have! To learn more about our other problem-solving products featured, click the buttons on the left. You can order the products you need on those pages. You'll want to order these products because they solve dozens of wear and performance problems - that are slowly working against your cars longer life. The products contain Hi-tech cleaners, conditioners, friction-modifies, and a protective anti-wear coating. Click on the above links to order those products. Or call me for advice.